Which lines of longitude and latitude pass through the most countries? This is an update from last week's post, where I considered a slightly different version of the first part of this question. I have illustrated this with some nice maps, all taken from Google, but with the latitude and longitude grid developed by Bill Chadwick of the Bracknell District Caving Club (a really neat idea which nobody else seems to have implemented). Which line of longitude passes through the most countries? The first part of the question is, which line of longitude, a straight line from North Pole to South Pole, passes through the most countries? Three of the westernmost spurs of Bulgaria are south of thirteen countries and also north of thirteen countries, Serbia counting both times. 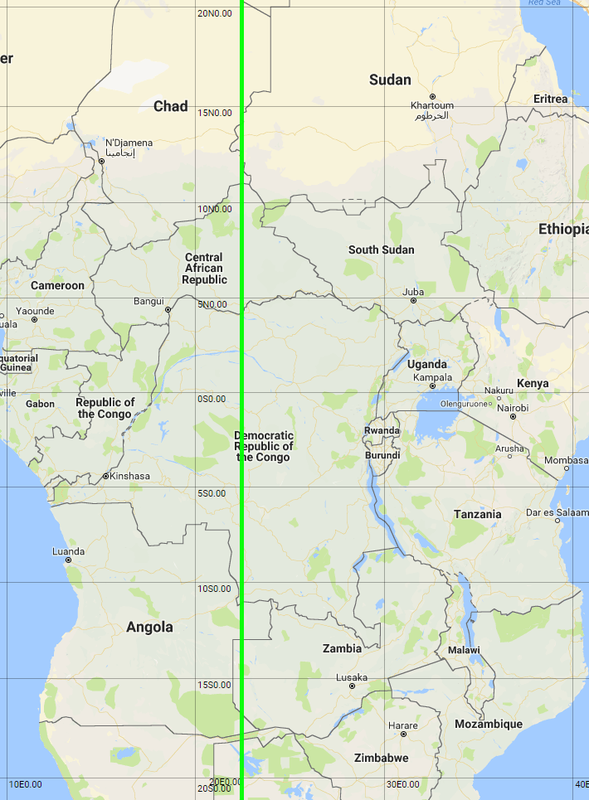 Here's the line passing through central Africa, to scale again, showing how it intersects both Sudan and Zambia. A corner of Libya is visible at the northern edge. The two countries on the southern edge are Namibia and Botswana, with South Africa off the map. This is a lucky confluence of frontiers at different latitudes. To the east, within less than half a degree you lose Slovakia, Serbia, Russia/Kaliningrad, Hungary and Macedonia before you gain Belarus and South Sudan, and then you lose Poland, Chad, Angola and Sweden. To the west, you lose Bulgaria, Ukraine, Zambia and Sudan before you gain Kosovo, and then you lose Estonia, Latvia, Lithuania and Macedonia. I can't imagine that any meridian that does not pass through Europa and Africa can come close to this total. In the Americas, Asia and Oceania, the countries tend to sprawl east-west as much as north-south, and they are generally bigger anyway. Which line of latitude passes through the most countries? So, that's longitude sorted. What about latitude? I found this much more tricky, but I believe I have identified two parallels of longitude which arguably pass through 27 countries. (Arguably, because one of them passes through what could be considered a 28th country, and the other passes through two territories which belong to different constituent parts of the same kingdom, so possibly should be counted together rather than separately). 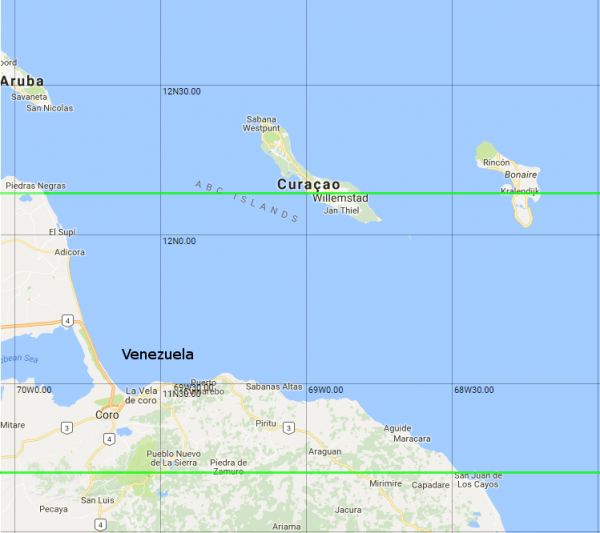 As far as I can tell, these are the band between 11°08'02.4"N and 11°08'25.8"N, defined by the northern frontier of Togo and the southern shore of Tobago (so I will call it the Togo-Tobago line); and the slightly wider northern band between 12°11'03.7"N and 12°11'34.4"N defined by the shores of Bikar Island in the Pacific Ocean (so I will call it the Bikar line). As I list them below, I put the ordering of each country in the form (a/b) where it's the a'th country on the Togo-Tobago line and the b'th country on the Bikar line. If it's a country on one line but not the other, I put an asterisk for the line it isn't on. These are actually really tight strips of the earth's surface. 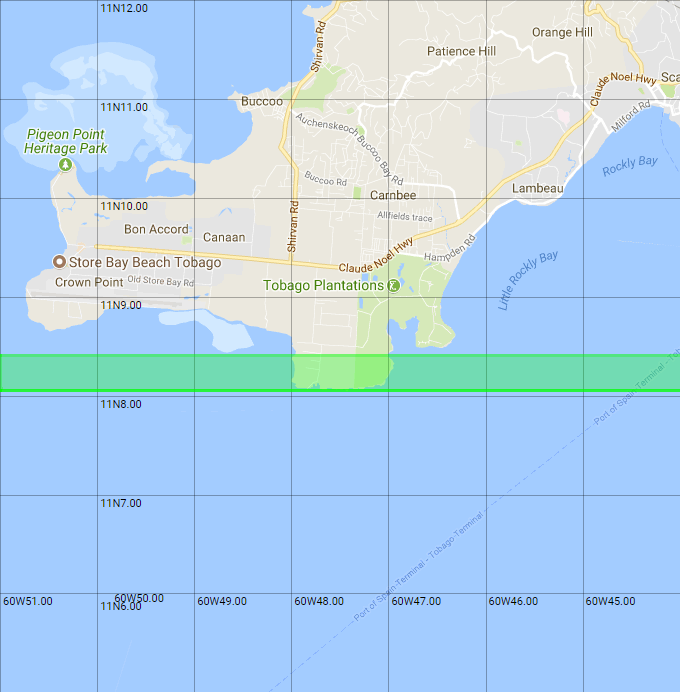 I reckon the Togo-Tobago line is about 700 metres from north to south, and the Bikar line just under a kilometre. Going east from the Atlantic, they hit the African coast at Guinea-Bissau (1/1) (the Bikar line just misses Senegal) and then head inland to Guinea (2/2), Mali (3/3) and Burkina Faso (4/4). The Togo/Tobago line passes through the southern suburbs of Burkina Faso's second city, Bobo-Dioulasso, but misses Côte d'Ivoire. Now we get to a weird bit of colonial map-making. The border between Ghana and Burkina Faso plays hide and seek with the 11th parallel before Ghana (5/*) lurches north in the region of Kulungugu. The border of neighbouring Togo (6/*) also has a peculiar northern kink, just enough to define the northern edge of the Togo-Tobago line. The two lines are shown to scale below. 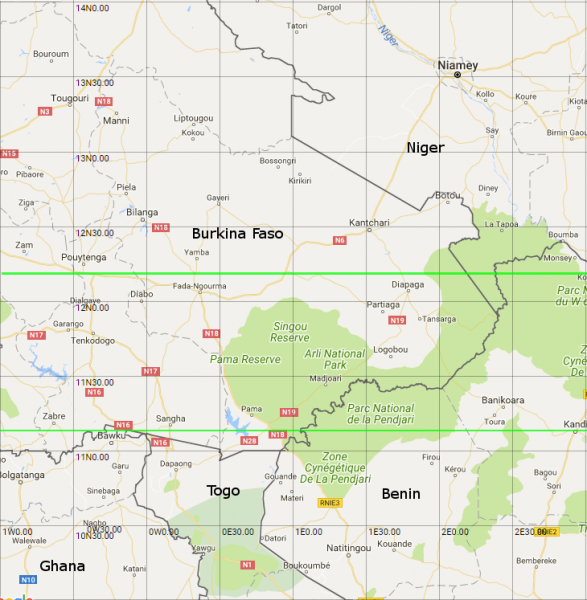 Farther north, the Bikar line hits Niger (*/5) before both lines pass into Benin (7/6), Nigeria (8/7), the northern spike of Cameroon (9/8), and Chad (10/9). The Togo-Tobago line just misses the Central African Republic, and both lines then pass through Sudan (11/10), South Sudan (12/11, a close shave for the Bikar line), Ethiopia (13/12) and Djibouti (14/13, a close shave for the Togo-Tobago line). 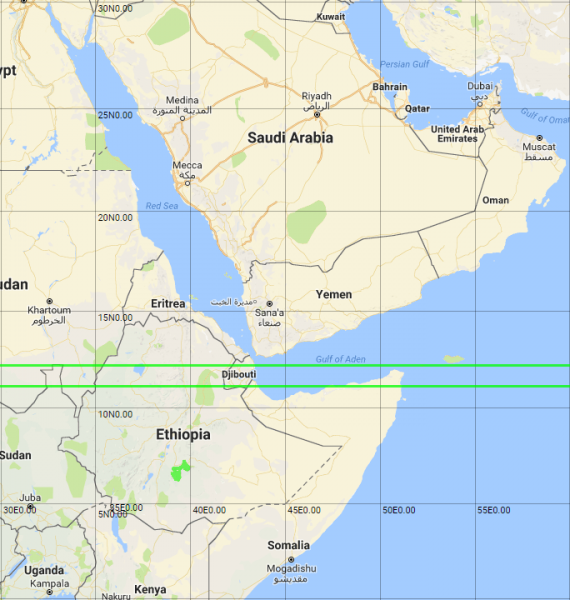 The Togo-Tobago line passes from Djibouti into the northern part of Somalia (15/*), hitting both Somaliland and Puntland (we'll get back to that later). The Bikar line just misses Eritrea to the north and Somalia to the south, but does intersect the island of Abd al Kuri and its main settlement Kilmia, part of the Socotra archipelago which belongs to Yemen (*/14). The lines on the map here are to scale. Both lines now cross the Indian Ocean, intersecting India (16/15), Myanmar/Burma (17/16), Thailand (18/17), Cambodia (19/18), Vietnam (20/19) and the Philippines (21/20). I have not investigated the various claims on the Spratly Islands, because as far as I can tell none of them is intersected by either line. The Bikar line passes over (or at least very near) the holy hill of Arunachala in Tamil Nadu. That takes us to the Pacific Ocean, where I have gone over the geography of the Marshall Islands (22/21) in some detail. 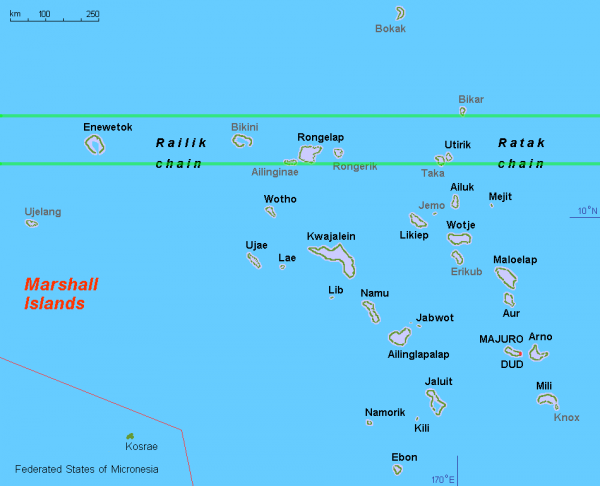 This next map, uniquely, is not from Google but from Wikipedia, showing the various Marshallese atolls and archipelagoes. The lines are not to scale - the distances here are pretty huge. 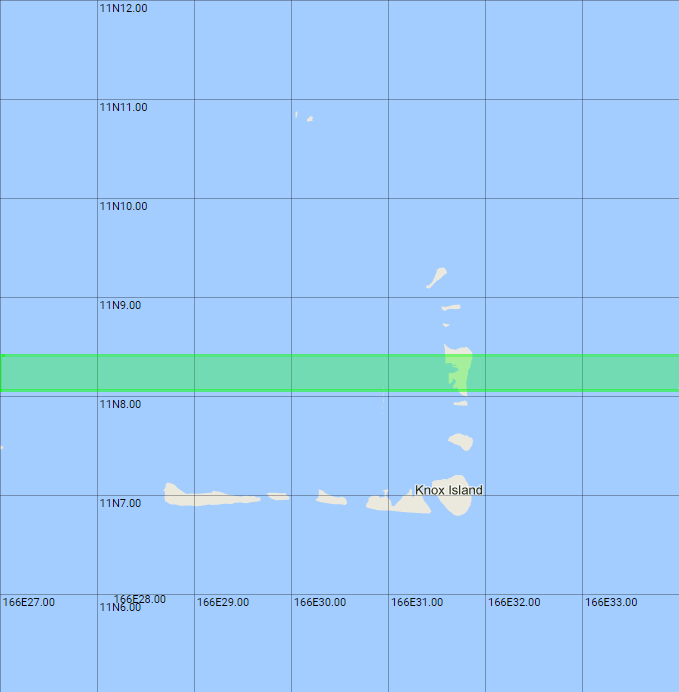 As far as I can tell, the Togo-Tobago line just scrapes part of Ailiningae Atoll - it grazes the southern edge of Sifo Island, completely covers Manchinikon Island, and passes through the middle of Charaien Island. It also grazes Taka Atoll, but passes between the islands of Waatwerik and Lojrong without making landfall. 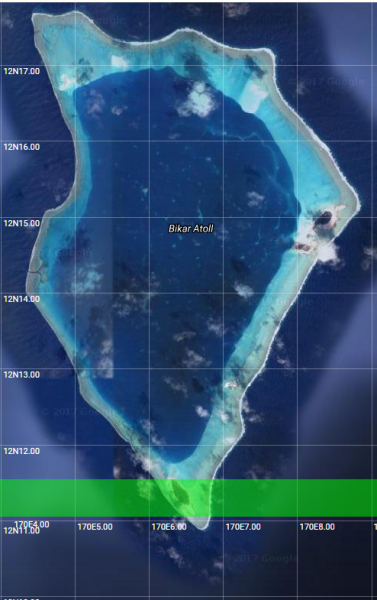 I'm posting the satellite view of Ailiningae Atoll as well as the map view below; doesn't it look beautiful? The tiny island of Charaien, at the eastern end of the atoll, is less than a kilometre from north to south. 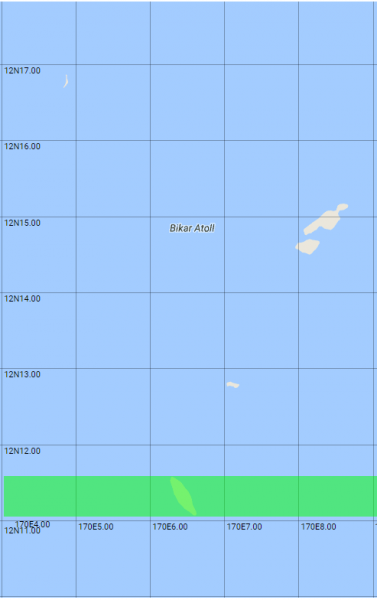 A little further north and east, the Bikar line is defined by the island of Bikar, part of the much smaller Bikar Atoll, very little of which is above water level. After a long landless passage, over 11,000 km, across the Pacific, we reach the Americas. Both lines make landfall in southern Nicaragua (23/22), and the Togo-Tobago line then dips in and out of Costa Rica (24/*). 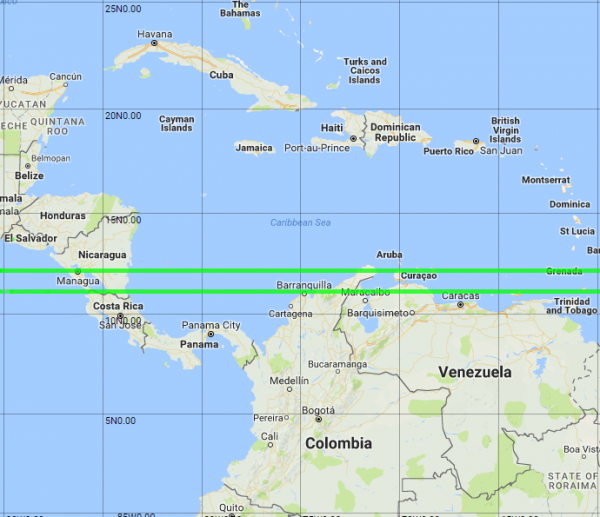 The lines cross the southern Caribbean to Colombia (25/23) and Venezuela (26/24). The Bikar line finishes its run of countries by passing through Curaçao (*/25), Bonaire (*/26) and Grenada (*/27). The two lines are shown to scale in all three maps below. 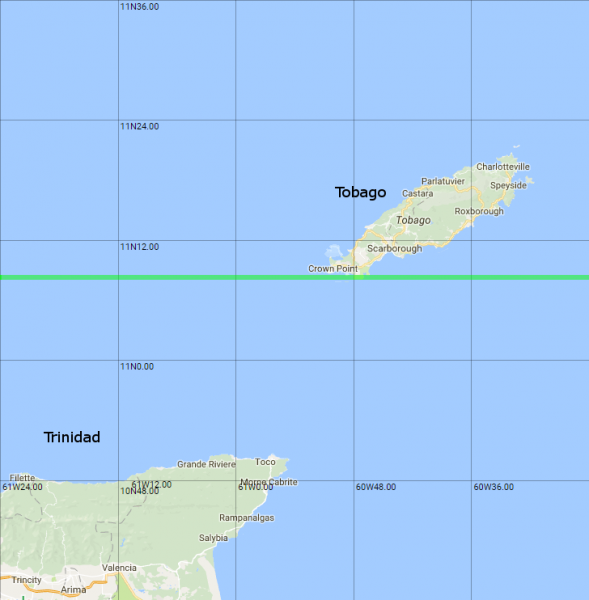 The Togo-Tobago line, true to its name, just scrapes the southern edge of Tobago, the northern and smaller island of Trinidad and Tobago (27/*). I think it's this map, rather than the Togo or Pacific island maps, that brings home just how narrow the Togo-Tobago line is. You can almost see the trucks parked in the plantations. Now for the caveats. First, I don't think it's clear that you can count Curaçao and Bonaire separately - while Curaçao is a separate constituent part of the Kingdom of the Netherlands, and Bonaire is a Dutch municipality, Curaçao notably does not have foreign policy or defence powers separate from the Netherlands (and therefore Bonaire); these are surely important attributes if we are distinguishing between states. So the Bikar line ends up with a fairly impressive 26 countries for sure, the 27th being a matter for experts on Dutch constitutional law. Second, my personal view is that Somaliland should be counted separately from the rest of Somalia. Empirically, Somaliland behaves more like and is treated more like a state than is Curaçao, so if we count the latter we should count the former as well. It may not have been formally recognised as an independent state by any other country (neither of course has Curaçao), but it does have foreign policy and defence capabilities; I have myself attended meetings of Somaliland's diplomatic representatives and ministers with European officials, and am proud to say that I had a small hand in negotiating the 2013 Special Arrangement for Somaliland, so it is clearly engaged in foreign relations; and the co-operation of Somaliland's defence forces with international anti-piracy efforts in the Gulf of Aden is not much discussed but quietly recognised by the international community. 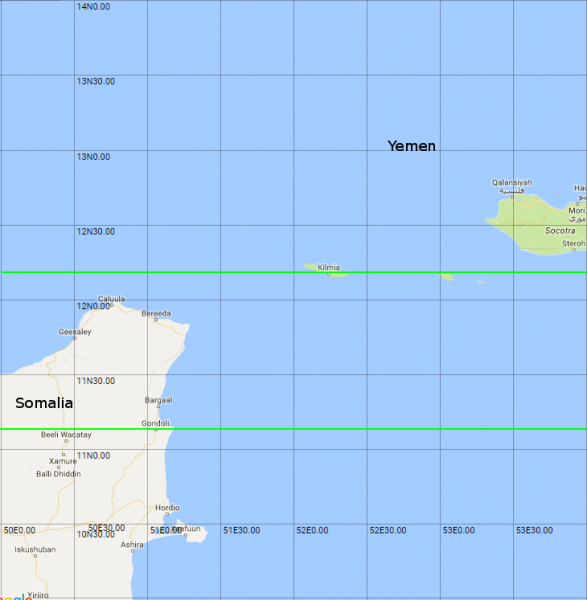 Given that the Togo-Tobago line passes through both Somaliland, at its frontier with Djibouti, and Somalia/Puntland, just south of Cape Guardafui, which are undisputedly part of Somalia (Puntland is not seeking independence), I personally will count it as the winner with 28 countries. A final thought - it’s interesting to compare this with the Datagraver map of world population by latitude and longitude. Their biggest population spike by longitude is a little to the east of mine, around 31° East (Cairo, Kiev, St Petersburg). Their biggest population spike by latitude is around 21° North, which looks like several Mexican cities, plus Nagpur and Hanoi. Trivia question to finish with: how many countries lie entirely south of the Tropic of Capricorn? Where do these lines cross? Yes, in Sudan and Chad. It should also be possible to find the great circles that pass through the most and fewest countries. We know the answer to the first challenge will be at least 26. I looked into antipodes a few years back, and I don’t think there will be a great circle with more than 27! Oh hang on, I realise that I was just thinking about great circles that pass though the poles. If we are going more widely, I think it will still be difficult to get much beyond 27. 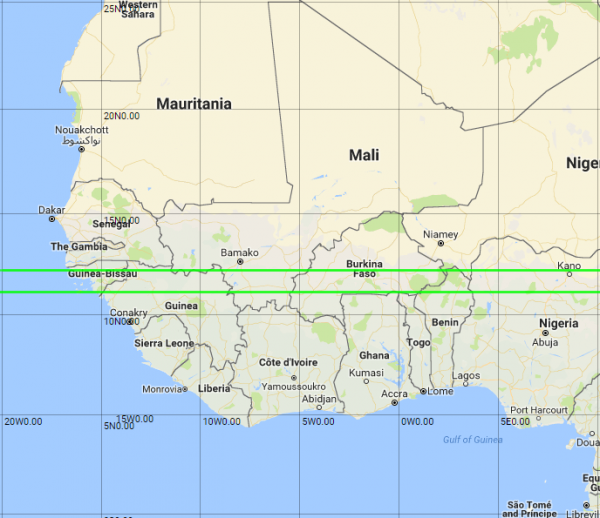 My line between 22°31'35.2"E and 22°33'32.1"E is very close to the great circle with the longest path through Europe and Africa, from 71.128589, 27.625022 to -34.8306859,19.9974562. But that misses Russia, Poland (I think), Slovakia, Serbia, Hungary, Serbia, Macedonia, Sudan and Zambia. You might just be able to tilt the other way and pick up another Eastern European country or two without losing too many in Africa. Or it might be possible to find something cunning that collects a lot of the West African states and also picks up a few in the Caribbean, though I think that runs into gaps in the Pacific Ocean too. No - that’s entirely correct!